For the first time ever on Nintendo 3DS™ handhelds, explore the strange and mysterious world of Gravity Falls! Playing as both Dipper and Mabel, you must help Jeff the gnome retrieve the ancient Gnome Gemulets to restore the forest’s magic! 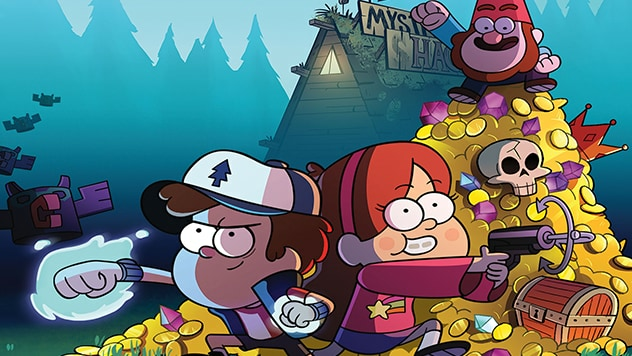 Promised gnome gold for their assistance and equipped with enchanted gnome weapons, the twins will have to fight off strange new creatures, defeat monstrous bosses, and solve puzzles in new and mysterious areas of Gravity Falls. Meet characters like Soos, Grunkle Stan, Old Man McGucket, and others along the way in this fun action-packed game for all ages. Gravity Falls: Legend of the Gnome Gemulets, powered by the acclaimed UbiArt Framework game engine,brings the look and feel of the show to Nintendo 3DS systems. Lush backgrounds and beautiful graphics allow you to explore your favorite places from the show, such as the Mystery Shack and the Gnome Forest, like never before! Gravity Falls: Legend of the Gnome Gemulets features a new, original adventure. 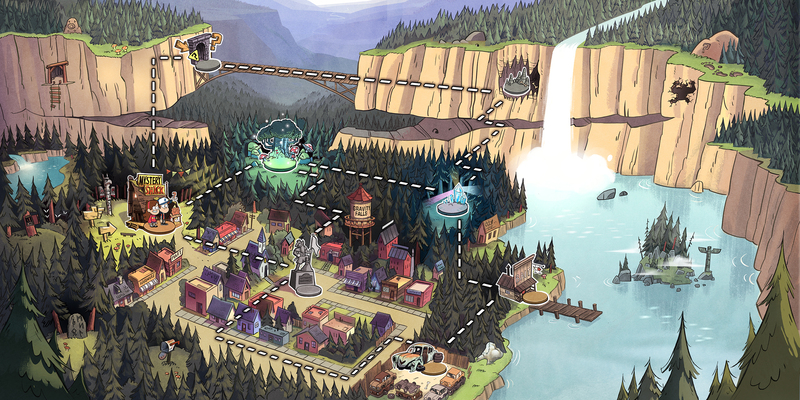 Unravel the mystery to learn new lore about the inhabitants of Gravity Falls and unlock secrets of the town’s past. Help the siblings work together, with dual character gameplay. Switch between characters at any time and use their unique powers and abilities to Defeat enemies and solve mysteries. • Dipper is bestowed with Gnome Battle Cuffs which deliver powerful punches at close range, and keeps his trusty flashlight by his side to shed light on the many mysteries in Gravity Falls. • Mabel wields the Fleece of Bedazzlement that lets her whip her sweater sleeves to attack monsters from afar, and her grappling hook is at the ready to help access areas otherwise out of reach. Come October 20, you’ll be able to explore some of your favorite locations from the show – places like the Mystery Shack and the Gnome Forest – in a brand new way!